I'd like to start this blog post out by saying that I am truly in love with what I've made. It's not everyday that Britex sends me beautiful fabric and lets me choose what to sew with it. And it's definitely not everyday that I spend more time on the details of a garment than on the actual sewing. I've been binging on knits the last couple of years and I wouldn't say that I'm hungover and not into them, but this project is a nice break. The shining star in the photos is most definitely the fabric. It's stunning, right? Until this point I had never sewn anything like it. 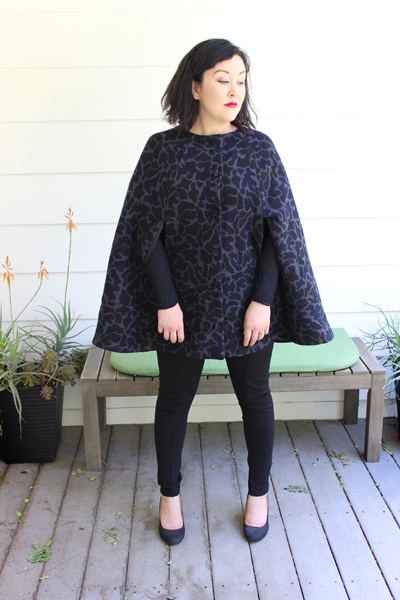 I kind of swore off sewing anything remotely like outerwear because I didn't want to put the time into making something that would only be worn a few times a year. 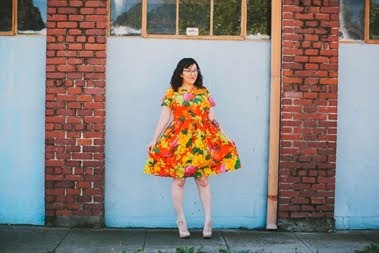 But then I thought about how if I did make something it would be a quality and classic item that I loved and if I was only going to wear it sporadically it would probably last forever. Or for years and years. Or whatever. 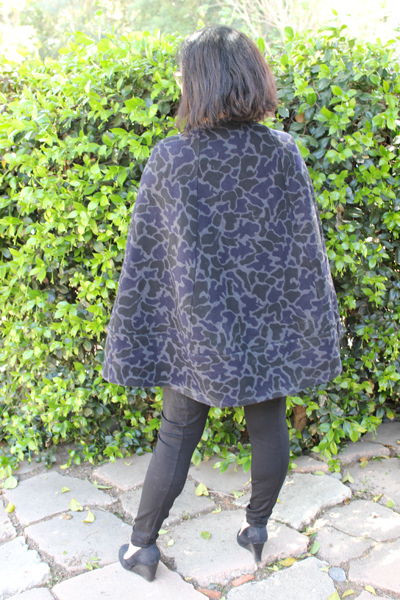 So that changed my mind and I chose to make something from the Amoeba fabric. And I'd like to pat myself on the back because it was an amazing choice in fabric. The fabric is coat weight, easy to press (shout out to my clapper inspired by MarrieB), didn't fray much (I used interfacing on the buttonholes though, just in case), and went through my sewing machine and serger without a hitch. It's amazing what a nice quality fabric can do for a garment! Leggings are an unblogged pair of Papercut Ooh La Leggings made from a ponte knit. I wear them almost every week and love them. The lining is also from Britex and purchased by me. It's a black bemberg rayon which sells for $15 a yard. It would have been cool if I had taken photos of the interior of the cape, but I was so stoked on taking photos of the outside, that I completely spaced on having my sister take some of the lining. So you guys will just have to take my word, that the fabric is niceeeee. 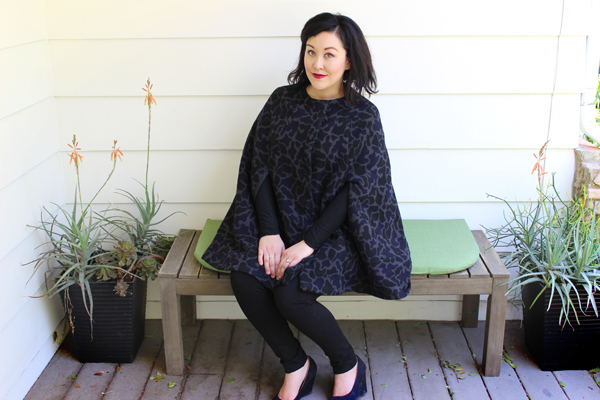 The cape pattern is the Camden by Seamwork. 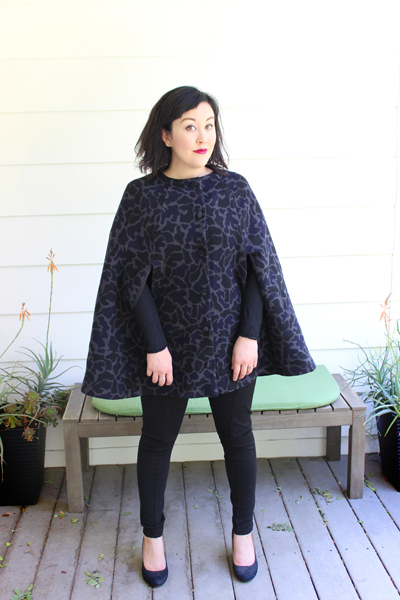 We all know how much I like Colette Patterns and Seamwork, right? I've always had success with following their instructions, the line drawings are spot on, and it's very rare that I have made something by them that I have been unsatisfied with. Camden is no exception. Totally smooth sailing on this pattern. The actual construction was simple (for me), so I decided to jazz things up and made some additions that weren't included on the pattern. Addition 1: fabric covered buttons. Never made them before, but thought, "why not?" They weren't difficult to construct at all (you can check out the tutorial I wrote for Britex on their blog) and I think they add a polished touch to the overall look. And honestly it was probably cheaper to make them than buy them! I bought the button parts from Wawak and at $1.55 I'd say it was a good purchase. 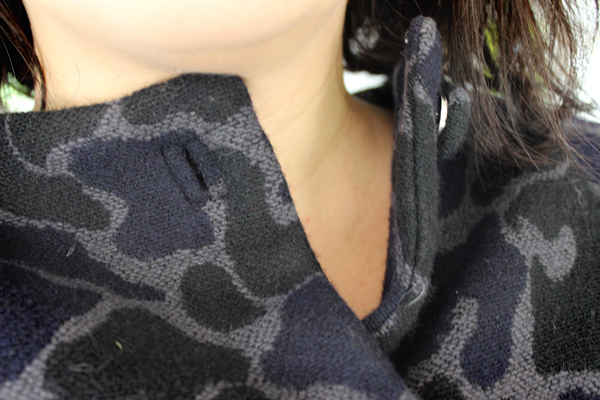 Addition 2: bound button holes. I had never made them before either (yay for learning new stuff!) and despite being nervous about it I took the plunge. Honestly, they weren't as bad as I made them out to be. 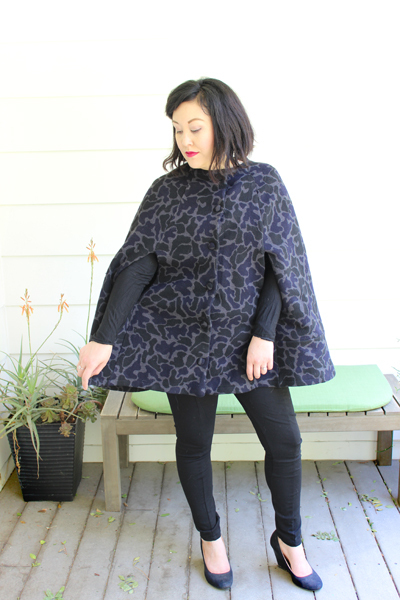 I closely followed the tutorial over on the Sewaholic blog, which was the online tutorial that made the most sense to me. That's not to say my bound buttonholes are perfect (far from it! ), but I am still really proud of how they turned out and super excited to add a new skill to my toolbox. Thanks to my sister for taking all these photos at her home. She said that if I didn't credit her on my blog she would sue me. She was joking, don't worry. These extra additions definitely added to my sewing and prep time, but even without them this project was a lengthy one. There are a lot of pages to tape together (it's a pdf pattern) and I definitely went through a few glasses of wine while taping and cutting (not complaining, it was an excellent Zin). There was a lot of pressing of the wool and of the lining and some hand stitching along the pockets and along the base of the lining. Honestly, there is no way I could have everything done in three hours, but that said, I am a slow sewer. It is quick, just not three hours quick (for me). How do you guys feel about sewing outerwear? Is it something you do often or is it more of a rare occurrence?